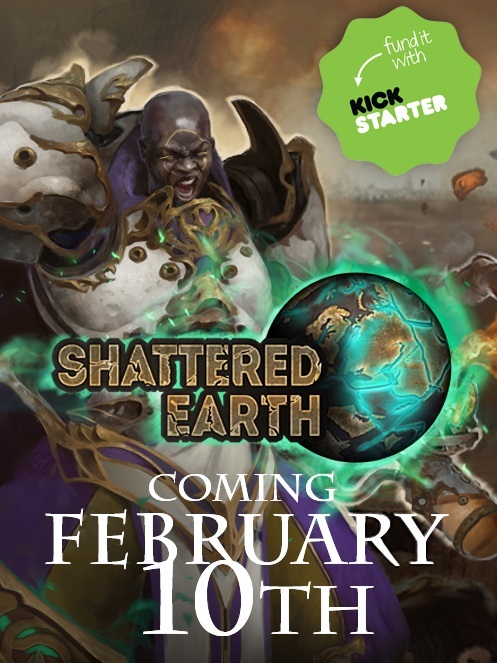 As you may know we are currently writing an article series for Beasts of War detailing the steps we’re taking as we approach the launch of the Shattered Earth Kickstarter on February 10th. A comment on our latest entry got me thinking about the ‘black box’ that is miniature production, and the reply I started writing quickly got out of hand, hence this (enormous) blog post. Firstly, a disclaimer: this in no way constitutes professional advice – it’s just what I’ve learned over the last year or so of trying to do this for a living. Also, the numbers quoted are merely examples and represent the range of prices you might be expected to pay rather than quotes from specific manufacturers. Lastly, Massive Awesome are a UK-based company so all prices are in pounds sterling. The best way for me to debunk some of the myths around miniature production is to run through the entire production process with a couple of imaginary miniatures; let’s call them Bob and Kate. Bob is a standard 28mm human soldier whereas Kate is an intricately-detailed 54mm collectors’ piece. Let’s start with Bob. Bob’s concept art was pretty straightforward to design and cost about £100. The sculpting was done digitally and again was a straightforward job – let’s call it £250. Bob was sent to the printers to have the master produced which cost another £100. Bob is now ready for casting; total investment so far: £450. Kate on the other hand took some time to get right. Her concept art needed several iterations and ran to £350. The sculpting also took some time to get all the details right, and she’s a complicated miniature, so that ended up costing £1,000. Due to her size and the amount of different pieces required, the 3D print was also a lot more complex and cost £350. Total investment for Kate so far: £1,700. There are three main materials that miniatures are cast in: metal (normally tin), resin and plastic (specifically high impact polystyrene, often referred to as HIPS). Some miniature ranges and a lot of boardgames produce their miniatures in a different type of plastic called polyvinyl chloride, more commonly known as PVC. I have zero experience casting in this material so I won’t be covering that in this article. If anybody has experience of casting PVC miniatures please share your thoughts in the comments! Right, let’s talk about metal. Metal is normally spin cast, which means you make a circular mould out of rubber or silicone and spin it at high speed to distribute the metal. You can use a 9″ mould for Bob and you can fit five of him in each mould. Each mould will set you back about £50, and let’s call it £3 for the metal (you pay by weight) and another £3 per spin. Assuming you get 50 casts out of each mould, your cost per miniature for Bob is £1.40 (=(3+3+(50/50))/5). Kate on the other hand needs an 11″ mould (£80) and you’ll only fit three of her in each one. She costs £5 in metal and £5 to spin, so her cost per miniature is £3.87 (=(5+5+(80/50))/3). 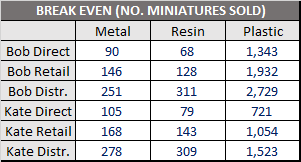 Resin production is very similar to metal production, although the miniatures are normally vacuum cast rather than spin cast. Some companies (particularly in the US) still make spin cast resin; it’s often a little cheaper than vacuum cast, but the miniatures are more likely to get air bubbles. Vacuum cast resin miniatures are probably the highest-detail you will achieve, but that detail has an effect on your mould yield. Mould costs per miniature are also more difficult to ascertain as it depends on how each miniature is cut. For our example we will assume Bob’s mould cost is £35 and Kate’s is £50, and you get 20 pulls from each one. Bob costs £2 in resin, therefore the cost per miniature for Bob is £3.75 (=2+(35/20)). Kate costs £8 in resin, so her cost per miniature is £10.50 (=8+(50/20)). Lastly we’ll look at plastic injection moulding. This form of production uses metal ‘tools’ to produce sprues, usually 6″ by 8″. Each sprue can hold multiple miniatures and, whilst the tools themselves can be very expensive, the cost of plastic is cheap. You also don’t need to worry about yield with injection moulding as each tool will last for tens of millions of casts. Working out a cost per miniature with injection moulding is quite difficult due to the large upfront cost, and the fact that you don’t need to replace the tool. The easiest way to reconcile this is to add the cost of the tool to your initial design outlay instead of factoring it into each miniature’s individual cost. We can create a sprue for Bob and, because he is quite a simple miniature, we can fit ten of him on each sprue. The cost of the tool is £8,000 and each shot of plastic is £1; the cost per miniature for Bob is therefore £0.10 (=1/10) because we aren’t including the cost of the tool. Kate is much more complicated and takes up an entire sprue on her own. She’s also got some pieces with quite a bit of depth to them, so the tool itself is more expensive at £12,000. We’re still paying £1 per shot, which is how much it will cost us to produce one Kate in plastic. Now you have a production-ready miniature to sell you need to set your RRP/MSRP. Production costs should normally run somewhere between 15% and 20%, so you can easily calculate your RRP/MSRP by multiplying the cost per miniature by 5 or 6 (note: this is where you need to decide who you’re aiming at; high-end boutique miniatures will obviously have higher production costs, whereas simpler 28mm humans will run closer to 15%). This will often produce a higher RRP/MSRP than you would like, so you’ll need to normalise that cost using other similar miniatures as reference, without undervaluing them. For metal, at around 15% production costs, we’ll price Bob at £7.99 and Kate at £24.99. For resin our production costs are higher at 20%, so Bob is priced at £12.99 and Kate at £39.99. For plastic it gets a bit more complicated as you’re unlikely to be selling ten Bobs in one retail box, but for our example let’s assume that the sprue can be cut into individual miniatures. Our (ongoing) manufacturing costs are low, so we’ll price Bob and Kate at the same as metal: £7.99 and £24.99 respectively. Now, this is where things get more complicated. Depending on where in the world your business is based, you will need to account for all appropriate sales taxes. As we are based in the UK we need to take off 20% to cover VAT. You will of course need to charge this to any applicable customers, but you have to pay it back so it works out as a zero sum. If you’re selling your miniatures direct (e.g. from your own web store) you can easily work out your income per miniature by taking the production costs off the net price. Selling direct looks good for your bottom line, but your product is only being advertised in one shop window, so your sales potential is limited. If you want to increase your reach you’ll need to start selling into retailers, who will obviously want to make their own cut on the sales. Let’s assume that every retailer buys from you at the same discount (note: normally you’d negotiate deals with each retailer separately and offer tiered discounts depending on how much stock they buy) which we’ll say is 70% of RRP/MSRP. Okay, so you’re in 30 or so retailers in the UK and sales are looking good, but you want to break into Europe and the US. You can of course start talking to retailers in those countries directly, but it’s far better (and less stressful) to have a distributor do it for you. Now, obviously, adding another link in the chain is going to impact your bottom line as the distributor will want to take their cut before the miniatures go to retailers, so we’ll say they all buy from you at 50% of RRP/MSRP. Now you know why the RRP/MSRP for a resin Kate is so high! Selling into distributors looks super-painful on paper, but they can exponentially increase your sales potential. You have to ask yourself if you want 80% of a small number, or 50% of a massive number. Of course, you need to have a commercially-viable product to begin with, but that should be your goal from day one even if you only plan to sell small numbers from your own web store. Let’s remind ourselves of our initial design costs – this is how much we need to clear to make any profit. As noted previously, we’ve included the tool cost in the outlay for our plastic miniatures. In order to break even we have to sell enough miniatures to clear our investment. We obviously make the most money selling directly, but our customer base is limited. If we sell into distributors we don’t make anywhere near as much money, but we could increase our customer base exponentially. Ultimately you need to decide where your game sits in the market, and plan your production accordingly. Phew! I think we all need a sit down and a nice cup of tea after that. Now, none of the above covers things like warehouse space, staff salaries for picking and packing, stock insurance, etc. but it should give you an idea of where the money goes, and what the different production processes are like. If this has triggered any further questions in your mind, please post them in the comments below. And, if you have your own experiences to share, we’d especially love to hear that.